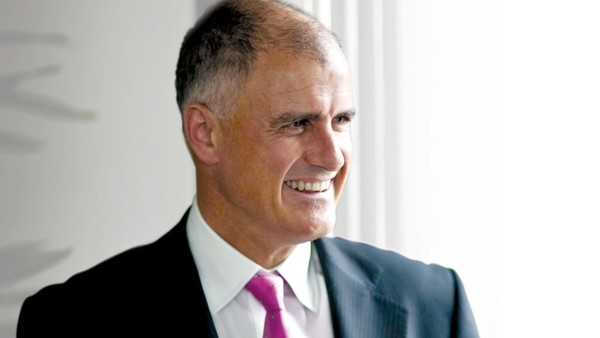 The Financial Times (FT) has published an interesting article, titled City financier urges UK support for £3.5bn Icelandic power cable – Plan to send geothermal electricity 1,000 miles under the sea to north-east England. The article is written by Andrew Ward, Energy Editor at Financial Times. IceLink is indeed an interesting project. But is doubtful that Mr Truell’s proposal is the “most detailed” plan on the cable to emerge, as stated in FT. So far, the most detailed official document on the project yet, is a recent report by Kvika Bank and Pöyry (the report was published last summer but is in Icelandic only). Numerous of the comments made by Mr. Truell do not align well with this report. According to Mr. Truell’s comments to the FT, “Iceland could supply 1.2 gigawatts of baseload power”. From this comment it seems that Mr. Truell has somewhat unclear understanding about how the project is seen by the governments of Iceland and UK. The plan is not really sending “geothermal electricity” to UK. Nor will the cable serve as access to base-load power, but rather be access to a flexible hydro power source. 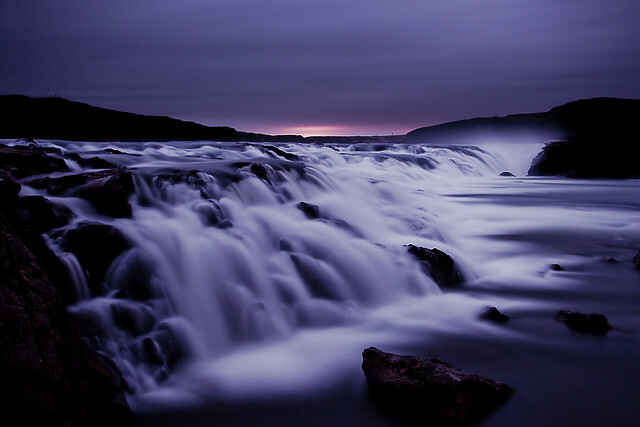 Readers should note that Iceland’s power system is mostly based on hydropower. The idea regarding the cable is mainly to utilize large hydro reservoirs to offer access to highly flexible renewable power source. Of course part of the power would be from geothermal sources (and also from onshore wind power which is likely to be constructed in Iceland). But the main power source for the cable would/will be the hydropower. In fact Iceland’s main problems in the power sector now relate to too fast construction of geothermal power plants. As was recently explained here on the Icelandic Energy Portal. It is possible that the cable would have a capacity of 1,2 GW. However, it is somewhat imprecise that the cable would offer a “supply of 1,2 gigawatts”, as Mr. Truell says to the FT. What really matters is how much electricity would be sent through the cable. According to plans introduced in Iceland, the annual amount is likely to be close to 5,000 GWh (5 TWh). This is the important power figure, rather than the capacity of the cable (which has not yet been decided and might be somewhat lower than the claimed 1,200 MW). The length of the cable might indeed become 1,000 miles, as Mr. Truell is quoted to say in FT. But according to plans presented in Iceland it is more likely that the length would be closer to 750 miles. In the end the length will of course greatly depend on where the cable will/would come on land in Great Britain. No such decision has been taken yet. According to reports presented in Iceland, the cost of the cable is not expected to be 3.5 billion GBP, as says in the FT article, but rather close to 2.4 billion GBP (central scenario). Total cost of the whole project would of course be a lot higher figure, due to the cost of new power plants and new transmission lines within Iceland. According to the Icelandic ministry of Industries and Innovation the total cost of the whole project would be 5-6 billion GBP (ISK 800 billion). 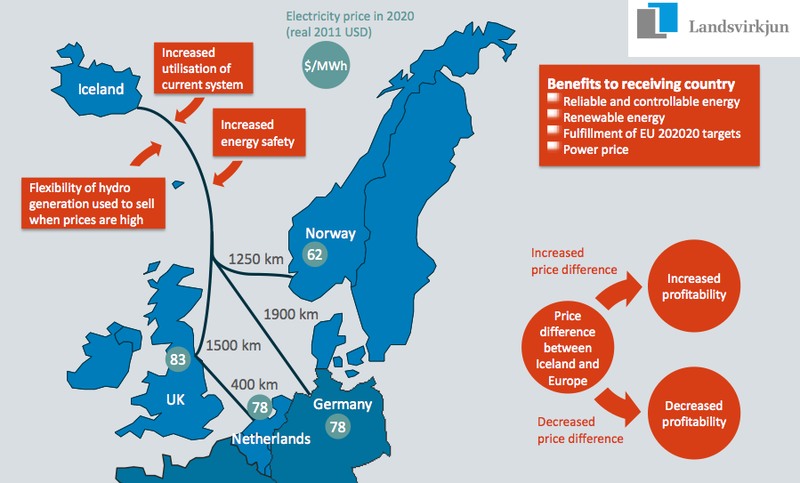 According to Mr. Truell, UK would get the electricity from Iceland at about 80 GBP/MWh. This figure is probably 25% to low (when having in mind the cost of the transmission from Iceland to UK). 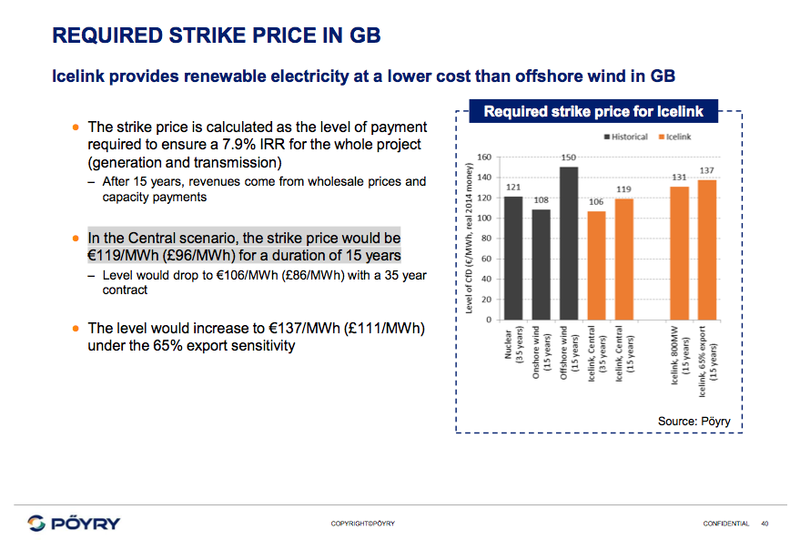 According to Pöyry, likely price would probably not be lower than close to 100 GBP/MWh. In the article in FT, it says that Iceland has offered “surplus electricity” to aluminium smelters, and Mr Truell says there is “still plenty left for export”. In reality the situation is a bit more complex. Currently, there is very little surplus-electricity in the Icelandic power system. It is expected that IceLink would need close to 1,500 MW of new capacity. To be able to supply the subsea interconnector with electricity, Iceland would need to build numerous new and quite expensive power plants. Such plants would harness hydro, geothermal and wind. Also Iceland would need to strengthen its transmission system. So the cable would mean huge new investment in the Icelandic power system and the project is only partly based on “surplus” electricity. 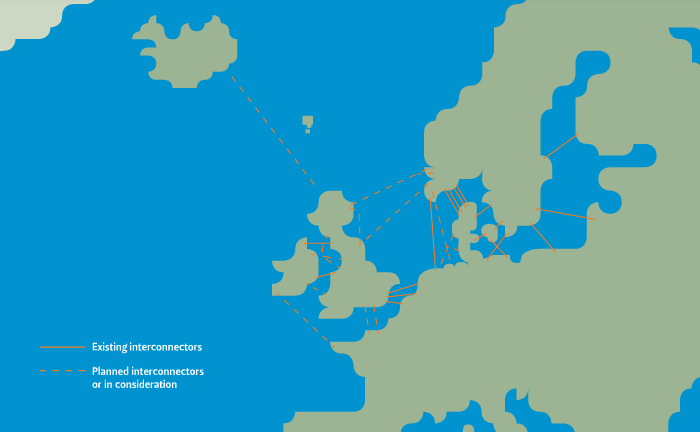 An electric subsea HVDC cable between Iceland and the UK is indeed an interesting opportunity, such as to increase the amount of reliable and flexible renewable energy in UK’s power consumption. And it would be wise for the UK to make the project a priority. However, note that Iceland is not at all an endless source of green power. And the people of Iceland will hardly have much interest in such a project unless receiving strong economical gains from it. In addition the project would/will be a major environmental issue in Iceland, due to impacts from constructing new power plants and transmission lines. And to avoid misunderstanding about the project it is extremely important to have the facts right.